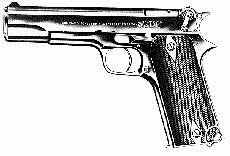 The 1920 was the first pistol Star made in the 'Colt 1911 style.' Although it has the general outline of the Colt and is locked via a Browning-style tipping barrel and link system, there are a large number of other changes. The pistol retains the rotating trigger and single transfer bar of the earlier guns and has a side mounted lanyard ring also taken from the 1914. The safety is a rotating lever mounted high at the extreme rear of the slide, on a very Model-1 looking slide-cocking knob.